70 PINT ROOM DEHUMIDIFIER: This sized unit is perfect for basements or your whole house. In just one day, you can remove up to 70 pints (9 gallons) of moisture from your home. Not only are humid homes sticky and uncomfortable, the high moisture levels can lead to growth of mold and mildew which can damage your health and your belongings. ENERGY STAR RATED: We don’t have to all become tree-hugging hippies to agree on climate change (it’s real) but one thing we can all agree on is the sweet relief of saving a few bucks on your monthly energy bills, am I right? Energy Star-rated appliances are not just better for the environment, but also for your wallet. BASEMENT DEHUMIDIFIER: You might be one of those people who likes the smell of a damp basement. That’s fine, but as humidity levels approach 60% it makes the environment more friendly to mold, mildew and other allergens. By pulling moisture out of your dingy basement you can create a more comfortable and safe environment for your family. QUIET OPERATION: You don’t always see it… but that’s the point. A peak sound level of 48 decibels means you’ll hardly notice the dehumidifier is running. For comparison, 50 decibels is about as loud as a secluded suburban street or a normal conversation at home, so you will never have to choose conversation over comfort again. POWER OUTAGE RESTART: If you experience a power outage due to a storm, you do not want to have to go around resetting all of your applainces and electronic devices. TOSOT dehumidifiers will revert back to their previous settings once power is restored, giving you one less thing to worry about after you get back on the grid. Note: As an Amazon Associate, I earn from qualifying purchases. If you follow a link below and make a purchase, I may earn a small fee. The Tosot 70 Pint with Internal Pump 4500 Sq. 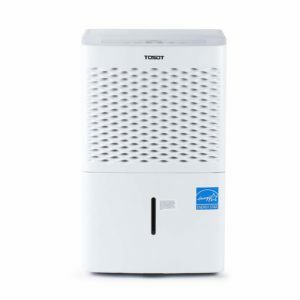 Ft. Energy Star Dehumidifier is currently my top pick for a dehumidifier. A few months ago we made a big move to a new house. It’s great and exciting – but also came with an entirely new set of problems to worry about, stuff which had never even occurred to me before. It’s built on the side of a hill, with a giant basement that includes some finished living space. There’s a coal furnace, an oil furnace, and two wood stoves. Despite this being a serene location in the middle of nowhere surrounded by grass and forest, I’m a bit concerned about the indoor air quality and radon levels. Naturally, my next step was to try to learn more. Exactly how much radon is in my basement? How can I measure the indoor air quality when I’m heating my house in the winter? This is important because it affects how often I air out the basement, whether I keep an air purifier running, etc… So I went on Amazon hoping to find something that would help answer my questions. The Corentium Home Radon Detector is my favorite for radon detection. 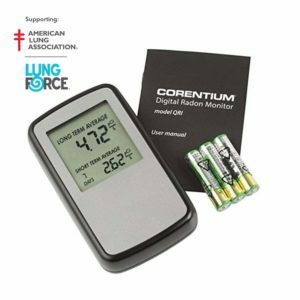 Per their description: “allows you to take a reading of the radon levels and the LCD screen displays the average daily, weekly and long term concentrations.” Powered by 3 standard AAA batteries. 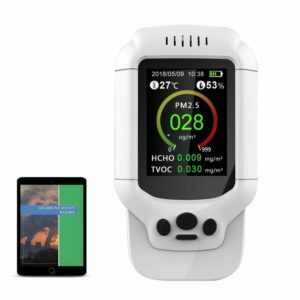 The Air Quality Monitor, Formaldehyde Detector, Pollution Meter, Sensor, Tester checks: “multiple measures of air quality including concentrations of formaldehyde, total natural & synthetic volatile organic compounds causing most odors (TVOC), and fine particulate dust matter (PM2.5/PM1.0/PM10)” but does NOTtest for radon. Author pixieblitz_gtsc5pPosted on March 8, 2018 January 3, 2019 1 Comment on Welcome!